Its popularity with families is clear because of the safe shallow water that makes it ideal for children to play in. 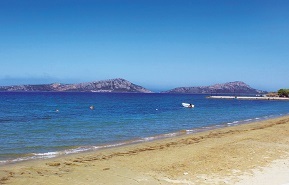 The clear blue sea is a delight to swim in (you may have to walk in some distance for deeper water), or to watch from the comfort of your sun lounger. You have 2 km of long sandy strip to choose from; actually the small dock at center splits the bay between two parts. The average depth of the beach is 10-15 meters. Although Gialova (Yalova) as a destination does get busy in the summer months the beach doesn’t fill up with holiday makers. It is a nice option because of the easy access especially if you choose one the resort’s hotels. The beach right in front of the village doesn't have the best sand but is handy for cafes and facilities. Further up the bay finds quieter spots and silky soft sand as you head more towards to south. A promenade runs along the seafront where you'll find plenty of restaurants and cafes. The bay is popular for private yachts who can anchor safely and whose passengers can enjoy the charming village of Gialova. There is a plenty of free parking lots during the daytime, just on the main road. During the late evening the place becoming very busy. Gialova is easy to find it because located on the main road that links the Pylos (south) to Gargaliani (north), the distance from Pylos is about 6km. Driving from Kalamata, you passing by the airport, at the roundabout follow the sign Pylos, at Rizomylos crossroad, you keep on slightly right side, signposted Pylos, at Kazarma junction drive straight and the last crossroad is near Pylos, where you need to turn right. Don’t miss the brilliant sunset, when the blazing sundown behind the glorious Sfaktiria islet. At the south part of the beach, there is some water sports activity by individual kite surfers. There is an interesting Folklore Museum presenting a record of the cultural and social texture of the area, with photographs and artifacts.